No, I love Tommy. 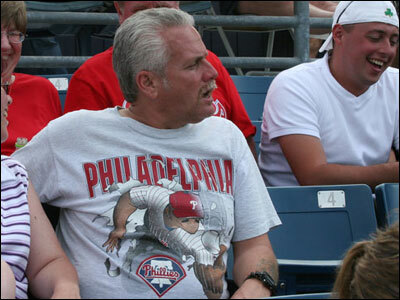 Tommy is the quintessential loud-mouth Phillies fanatic. It seems he's always yelling something negative but loves his team to no end. For Tommy, the innocence is not lost. His Phillies are not the defending World Series champions. They are also-rans who break his heart year in and year out. Remember those days? Like Tommy says, "following the Phillies is like an Etch A Sketch. You just shake it and start over again." Tommy relocated from Philadelphia to Ft. Myers 20 years ago. He's been coming to City of Palms Park since Day One, and is a Red Sox spring season ticket holder. Tommy's got a booming voice, "like Martin Sheen," as he puts it. I had the pleasure of sitting with Tommy during Sunday's Phillies-Red Sox game. While he threw in a few gratuitous expletives (prompting North Andover's Doug Tracia and the Sox fans in the section to yell "Go to Philadelphia if you want to talk like that, not here" and "Hey, we got kids here!") on more than a few occasions, the catcalls were beyond entertaining and a throwback to the old days at Fenway. From the get-go, he went after outfielder Pat Burrell when he stepped to the plate in the first inning: "Disappoint me like you always have Pat! Do something stupid. ... Go ahead Pat. Go ahead Pat. Be what you are, an indignant young guy, like 'I have everything.' Way to go Pat, Have your hands up very high -- you were taught that by Larry Bowa, but then again where is Larry Bowa now?" Tommy turned his verbal rant on catcher Todd Pratt. "Go ahead, pretend like you have a job tomorrow, 'What team am I on?'... you always disappoint ... (after Pratt hit a pop-up) Way to go Todd! Way to go Todd! See you in the minors!" On infielder Tomas Perez: "He's weak, takes everything inside. Outside, he's gonna swing at it. 'Do I hit? I'm not quite sure.' You're not gonna be on this team, back to the bushes!" "They don't know baseball! ", barked Tommy at Sox fans who thought David Ortiz was attempting to steal (in reality, the hit-and-run was on). When Edgar Renteria hit a bomb over the fence, Tommy said "you gotta love a dinger regardless of who hit it." The good feelings were short-lived. When infielder Placido Polanco stepped to the plate, Tommy mimicked him: "I'm not quite sure (if I want to sign here)... give me another million." Then he's on Jimmy Rollins: "I got a contract, I don't have to play." Tommy took a few shots at Tito, too. "(Terry) Franconi (sic), we used to have him. As a manager, I don't like him. 'Well, we're gonna win some games, if we lose some, oh, we'll be happy about that.' ... I don't like the whole 'Tucan Sam' thing." Its amazing that Earl the usher hadnt tossed Tommy by the time the Sox pulled ahead 5-4 after Philly blew a 4-1 lead for him. But Earl had some sympathy for poor Tommy, who had to erase the Etch A Sketch yet again. When we left the cantankerous cat caller, he was busy trying to move his Sox-Yankees tickets for Monday nights game to the Sox fans in our section.